755 is the homerun record set by Hank Aaron. Bonds should be surpassing that anytime now. Living where I do, my opinion probably isn’t a very popular one. Rather than share it, I direct you to this great article by Rick Reilly in my last Sports Illustrated issue. 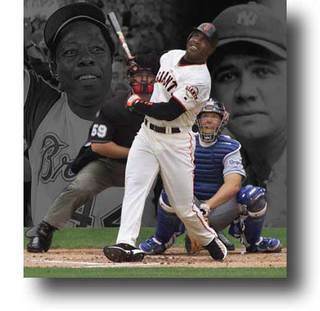 I say why Honor Barry Bonds and continue to keep Pete Rose out of the Hall of Fame? Not that I condone his gambling on baseball but at least he came by his record honestly. Since Major League Baseball doesn’t seem too interested in protecting the integrity of the game anymore it is time to stop the hypocrisy when it comes to Pete Rose. I say it’s time for Bud Selig to get a backbone and ignore hit number 756. “Out of respect for the tradition of this game, the magnitude of the record, and the fact that all citizens in this country are innocent until proven guilty, I will attend Barry Bonds’s next games,” Selig said in a statement. If that isn’t gutless I don’t know what is.